Have you ever been to a theme park run by Disney? If so, it was probably a pretty magical experience. I remember going to Disney World when I was seven and being just enamored by everything, and I’d love to go back some day. 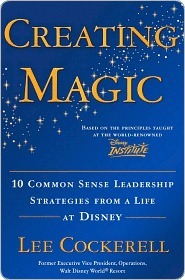 Disney has thrived as a company for a very long time, and so I was intrigued when I saw a book called Creating Magic: 10 Common Sense Leadership Strategies from a Life at Disney. This book was written by Lee Cockerell, a former executive at Disney, and it is an astounding read for anyone who works in a leadership position. This book contained some of the most practical advice about leadership that I’ve ever read. It was incredibly inspiring, and it helped me to feel a little better about my own situation because it helped to renew my focus of providing the best version of myself for my coworkers and customers. Work places are incredibly varied, but I believe that this book has a little something for everyone. It does contain some Disney-specific anecdotes, but there are many principles that can apply to anyone who leads any number of people in any context. I believe that even leaders in non-customer service-oriented industries can benefit from this book because it focuses so much on communication and employee treatment. I appreciated how quick of a read this was. It didn’t get bogged down by jargon. Instead, it was very accessible and fast-paced. I also just really loved that the focus was people, customers, communication, and employee satisfaction instead of just the bottom line of profit. The book explains why top-down management just doesn’t work anymore, and it provides some excellent alternatives. I am not in management, but I do train people, so I still found that this book was very helpful even if I was not it’s target audience. If you have any sort of leadership role in your work and you’re feeling a bit flustered or stuck, I would definitely encourage you to read this book. Previous postNew Year, New Opportunities!